Last Sunday I presented a garden-to-table cooking demo called Sensational Cool Season Salads at the Northwest Flower and Garden Show. I showed how to make salads that highlight great winter produce. I’m always a huge bundle of nerves before any public speaking engagement, but I think it went pretty well. I crammed four salad demos into an hour-long presentation. It was a close-run thing at the end, and I used every minute, but I did get all the salads made! Phew! My friend Jason, a master gardener and the owner of Third Spring Landscape Design, snapped this photo of me up on stage with my salads once the presentation was over. For all you guys who weren’t able to make it, here are the recipes! All Kale Caesar! 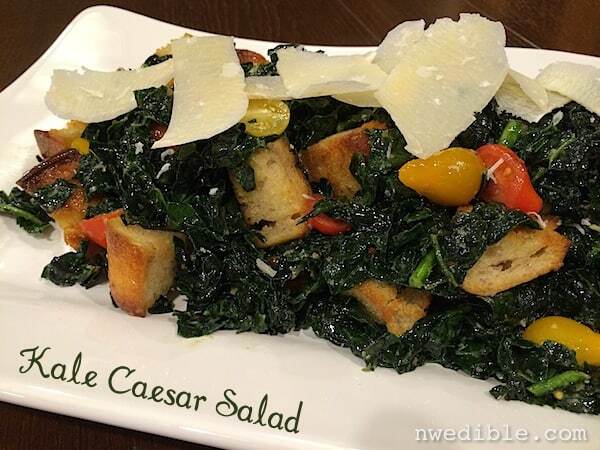 The classic Caesar flavors of garlic, anchovy and parm get tossed together with salted kale, homemade croutons and grape tomatoes. The homemade croutons are key – box croutons are not allowed. Make your own and you’ll never go back to cardboard croutons, I promise! The dressing for this salad is the variation preferred by Pioneer Woman. The addition of a bit of sweeter balsamic really works with the kale. Remove the thick stalks from the center of the kale. Pile the leaves on top of one another and roll together. Cut the kale into thin strips. Place the kale strips into a colander set over a bowl and rub together with 1 tablespoon kosher salt. Let kale sit for 30 minutes. This will draw out some of the bitterness from the kale and make the leaves more tender. After 30 minutes, rinse the kale well with cold water and spin to dry. Proceed with recipe. While kale is draining, make the fresh croutons. Preheat the oven to 450*F. Tear or slice the bread into bite-size chunks and toss the bread pieces together with the olive oil. Season generously with kosher salt. Spread the croutons in an even layer on a parchment-lined baking sheet. Toast croutons, stirring occasionally, until golden, dry and crisp, about 15 minutes. Set aside to cool. Once fully dry and cool, croutons will keep at room temperature for about a week. Make the dressing. Measure the anchovies, dijon mustard, balsamic vinegar, Worcestershire sauce, garlic, lemon juice into a blender or food processor. Add oil and blend on low speed for several seconds until dressing is smooth. Add in cheese and pulse to combine. Season to taste with salt and a black pepper. Dressing can be made up to two days ahead and kept refrigerated. To assemble the salad, toss the drained kale together with the croutons. Add enough dressing to just coat, and toss with clean hands until dressing evenly coats kale and croutons. Add halved cherry tomatoes and toss very gently to mix. Transfer salad to plates if desired and top with shaved parmesan. This salad makes a great vegan light entree. The dressing is made with tahini, which is like peanut butter, but made with sesame seeds. 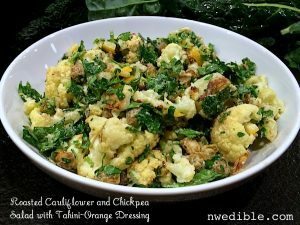 It works very well with the cauliflower and chickpeas in this salad. If you have salt-cured lemons, use them. (See more: How To Make Salt Cured Meyer Lemons.) They really help the salad to pop. If you don’t, some extra lemon juice wouldn’t be out of place. 1 large head Cauliflower, trimmed. 1 cup cooked chickpeas, drained and patted dry. Preheat the oven to 450*F. Break or slice the cauliflower into florets and add to a large bowl. Add chickpeas to bowl with cauliflower, drizzle olive oil over both, season to taste with salt and pepper and toss to combine. Spread cauliflower and chickpeas out on a parchment-lined sheet pan in a single layer and roast until cauliflower is tender and caramelized and chickpeas are crisp, about 25 minutes. While cauliflower and chickpeas are roasting, make dressing. Blend tahini, orange zest, orange juice, lemon juice, garlic and salt and pepper together. Add enough water to make a nice, thick but pourable dressing. Dressing will tend to thicken as it stands. When cauliflower and chickpeas are done, set aside to cool to room temperature. In a large bowl, toss cauliflower and chickpeas with salt-preserved lemon, flat-leaf parsley and enough Tahini Orange Dressing to coat. Season to taste. Go easy on the salt if you are using the salt-cured Meyer lemons. 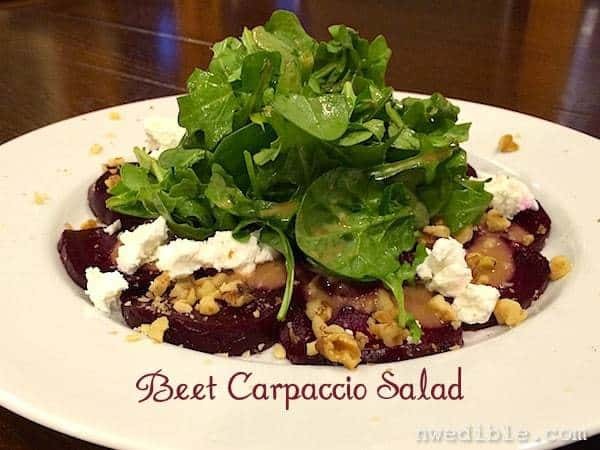 A meatless take on the beef carpaccio presentation, this salad brings together the classic flavor combination of roasted beets, goat cheese, walnuts and arugula. 2 oz. baby arugula, mache, microgreens or other tender greens. Whisk together the thinly sliced shallot, balsamic and red wine vinegar, honey and Dijon mustard in a medium bowl to blend. Whisk in the olive oil. It’s fine if the vinaigrette isn’t totally emulsified - we want a “broken” look for this dressing. Season the vinaigrette to taste with salt and pepper. Frisée is a lovely cold-weather green in the chicory family. It’s less bitter than chicories like radicchio, and is particularly mild when grown in cool weather. It has a nice texture and stands up well to rich accompaniments like bacon and blue cheese. Both are used in this salad, along with pear and pecans, making this salad substantial enough to serve as a light meal. I used my homemade, unsliced slab bacon here, and so was able to cut it into chunky lardons. (See more: You Can Make Bacon At Home.) If you are buying bacon, get the thick-sliced kind. Once you cook down paper thin bacon there isn’t really anything to it and it doesn’t work well in this application. 2 oz blue cheese, crumbled. Wash, trim and dry frisée. Place in a large serving bowl. In a large non-reactive skillet, fry bacon lardons over medium heat until they’re crisp and have rendered their fat. Transfer lardons to a paper plate to drain and set aside. Pour out most of the bacon fat, reserving about 4 tablespoons in the pan. Add the minced shallots to the reserved bacon grease and cook until translucent, about 2 minutes. Add the apple cider vinegar, Dijon mustard and maple syrup to the pan. Whisk to combine into a warm, emulsified vinaigrette. Adjust seasoning to taste. Pour dressing over frisée and toss all together. 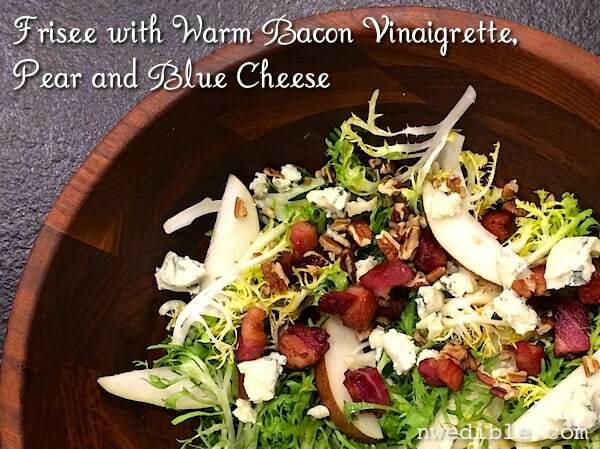 Scatter the reserved bacon, diced pears, blue cheese and pecans over the frisée. Serve right away. 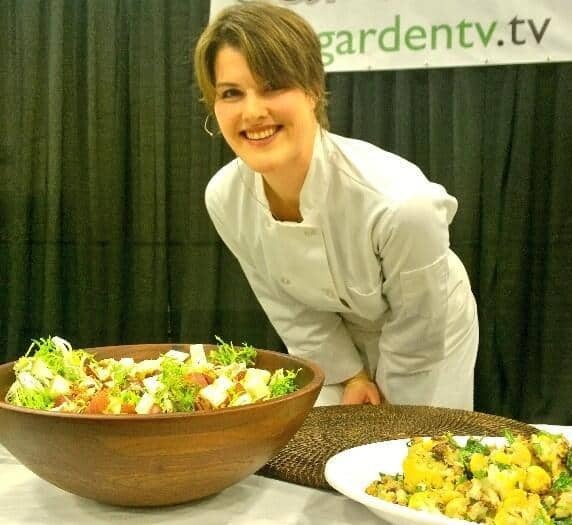 Happy salad making, and thank you so much to everyone who came out to the Northwest Flower and Garden Show! I can’t tell you how much it means to have friendly faces in the crowd. You guys make this kind of thing a lot of fun. Those salads look awesome Erica! Thanks for sharing! Wow, wow! Wish there was some acceptable way I could get these recipes into the fine dining establishments around here (not just at home!). Thanks, and congratulations on what must have been sure winners at the show! What a fabulous event! If I lived there I would so be THERE. Great looking salads. I will be building keyhole gardens this spring so that I can more easily garden year round in them. Maybe next year I will have the goods to make all these amazing salads. You’re awesome-sauce! Thanks for the recipes! I visited the Garden Show, and was so hoping to see one of your seminars and to meet you, since I’ve been following your blog for a while now and really enjoy it. Unfortunately, the Seahawks parade coincided with my trip downtown, which held me up long enough to miss your talk. Oh well. Go Seahawks go? Lovely recipes. Winter makes us a bit more inventive with our salads. No bad thing! This is the first comment I have ever posted here, although I enjoy your blog very much. Just want to let you know that I made the kale caesar salad and it. was. incredible! Thank you very much for the recipe and all of your words of wisdom and wit. Made the Cauliflower & Chickpea salad for guests tonight along with baked fish with caper olive tapenade and some steamed veg. It was a hit. Thanks for the great idea.